This image shows Rho Ophiuchi, a vast stellar nursery where new stars take shape from billowing clouds of gas, as viewed by ESA's Herschel Space Observatory. Located about 440 light-years from us, in the constellation Ophiuchus, the Serpent Bearer, Rho Ophiuchi is one of the nearest star-forming regions to Earth. Some of these clouds appear dark when observed at optical and near-infrared wavelengths due to the presence of dust, a minor but crucial component of the interstellar medium that pervades our Galaxy. However, they appeared anything but dark to the infrared eye of Herschel. Observing the sky at far-infrared and sub-millimetre wavelengths from 2009 to 2013, Herschel could catch the faint glow of dust grains interspersed in these clouds. Astronomers can use this glow to trace the otherwise dark gas where star formation unfolds. 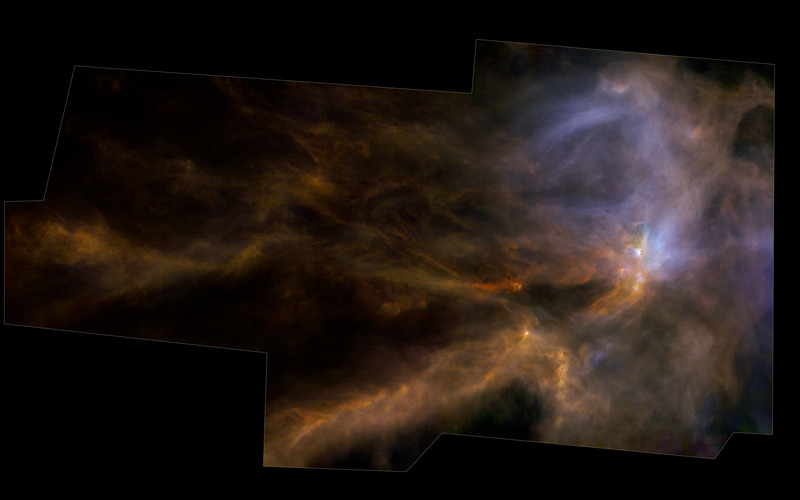 Herschel's view reveals a tangled network of filaments, weaving their way from the darker, less dense regions on the left of the image towards the brighter, denser parts of the cloud, on the right. The bright clumps embedded in the cloud are the seeds of future stars and planets. Filaments like these were uncovered by Herschel throughout the Galaxy, indicating that these structures play a fundamental role in the processes that lead to the birth of stars. This three-colour image combines Herschel observations at 70 microns (blue), 160 microns (green) and 250 microns (red), and spans 7.9° by 4.6°; north is up and east to the left. The Herschel Space Observatory was launched on 14 May 2009 and observed the sky for almost four years, until its coolant ran out on 29 April 2013.